Kringle! This is a family tradition. My family is a little short on traditions, so the few I can grasp, I hold on tight. My mom's family is Czech, and we have lost many of the Czech traditions. I think this particular recipe is not Czech, per se, but it is in the same family as kolache or rugelach. 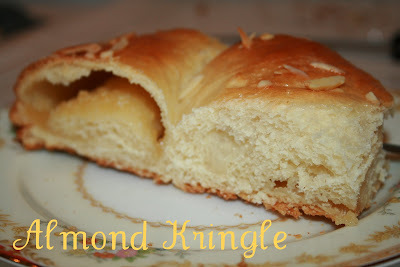 Kringle is a type of pastry, like a Danish. The shape is what makes it stand out. 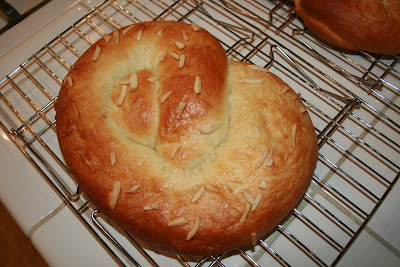 You can honestly make any shape you want, wreaths, twists, whatever, but "Kringle" means "knot" from what I remember. Whatever language it is, it's tasty. 1. 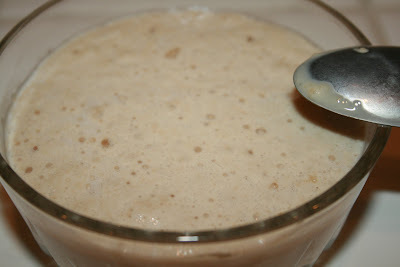 Proof your yeast in the warm water with 1 teaspoon sugar for about 10 minutes. It should foam up quickly. 2. Combine the milk, sugar, salt, and butter in a glass bowl. Microwave until you melt the butter. 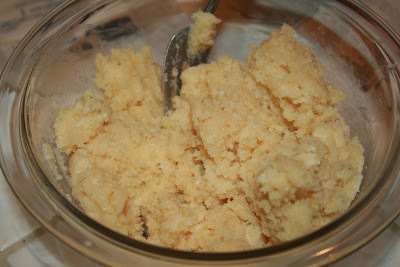 Combine the butter mixture with about 2 cups of the flour, beaten eggs, and proofed yeast. Using an electric hand mixer, beat on low to combine. 3. 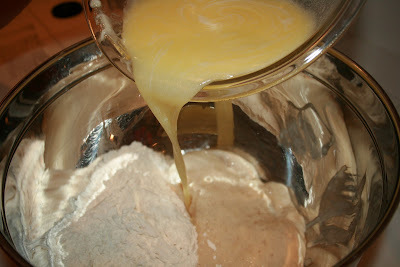 Now, using a wooden spoon, mix in more flour about 1/3 cup at a time, until you have a soft dough that isn't very sticky. You may not need to use all 4 cups of flour. I used about 3 3/4 cups for this batch. 4. Lightly sprinkle your work surface with flour. 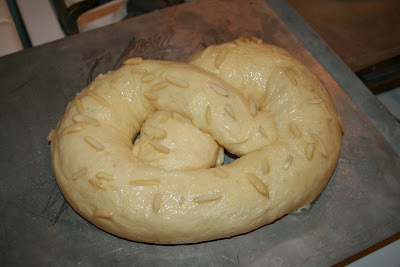 Knead the dough until it has become elastic, about 10 minutes. If you are unfamiliar with kneading, you will go in a fold-turn 90 degrees-press-repeat pattern to knead. 5. Grease a large bowl. 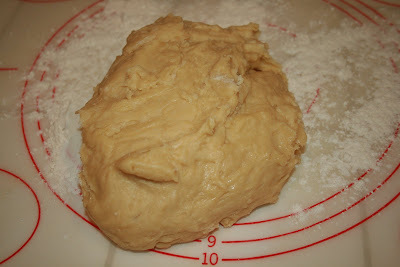 Place dough in the bowl and let rest, covered, in a warm place until doubled in volume. 7. Remove dough from bowl. Punch down. Cut into three, evenly sized lumps. 8. 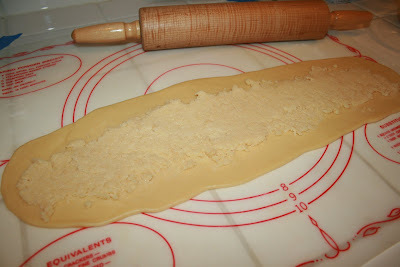 Roll one lump of dough out into a long rectangle, about 4" x 30" (or as long as you can get). 9. Spread about 1/3 of the almond filling on the dough rectangle. 10. Roll up along the long side to make a very long tube. Twist and arrange into a pretzel shape with the seam down on an ungreased cookie sheet. 11. 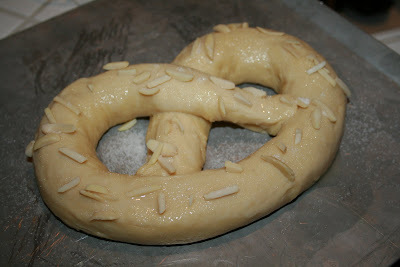 Brush the top with the egg white wash. Sprinkle generously with the extra sugar and slivered almonds. 12. Repeat steps 8-11 to make two more kringles. 13. Let kringles raise about 30 minutes, or until they have roughly doubled. 14. 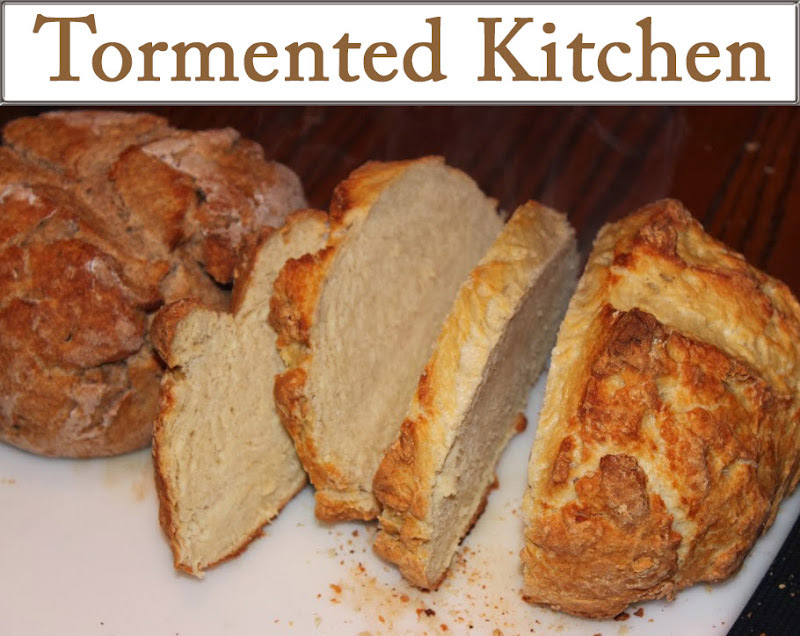 Bake in a preheated 350 F oven for about 25-30 minutes, until golden brown, top and bottom.